The offense continued showing good things on the second drive, giving rookie QB Mitchell Trubisky a number of quick passes to get into a rhythm. As a result, Trubisky looked more confident and did a much better job making accurate passes for the 2nd week in a row. I’ve given offensive coordinator Dowell Loggains a hard time this year, but he had a pretty good day today. It was the 2nd time in 9 games with Trubisky that he actually tried to run an NFL offense. Don’t look now, but Mitchell Trubisky has been playing better. It’s now been two weeks in a row that he’s completed more than 75% of his passes, thrown a touchdown, avoided turnovers, and posted a passer rating above 110. In 5 games since the bye, he’s avoided throwing an interception 4 times, and posted a passer rating of 88 or higher each of those times. His completion percentage and yards per attempt continues to creep up as he gains more experience. Continuing to watch his progression these last three games should be fun. Running back Tarik Cohen had a painful day with two touchdowns called back. On the first, a long run down the sidelines, he was correctly ruled to have stepped out of bounds. On the second, a quick screen in the red zone, right guard Tom Compton had a blatant block in the back that was completely unnecessary. The dynamic rookie continues to make plays when given the chance (14 touches for 85 yards), and I look forward to seeing how a creative coach will utilize him next year. Speaking of penalties overturning big plays, that was a bit too much of a trend today. The offensive line in particular picked up a number of them. To the OL’s credit, though, they generally did a good job holding up against a quality Cincinnati pass rush and opened some nice holes in the running game. On Chicago’s 2nd offensive drive, Trubisky made a throw after running past the line of scrimmage and was correctly penalized. For some bizarre reason, John Fox decided to challenge, which he quickly lost. That time out really would have helped them later in the half as they tried to mount a last-second field goal drive. After ignoring him the last two weeks, the Bears went back to rookie TE Adam Shaheen, who showed he is clearly the best tight end on the roster. He made three big plays in succession late in the second quarter, but unfortunately the drive ended with him dropping a touchdown. In the second half, they looked to him in the end zone twice in a row from inside the 5 yard line. On the first play, he drew a pass interference penalty, and on the second he caught his 3rd touchdown of the season. Unfortunately, he came up holding his right shoulder, but it doesn’t seem to be serious, as he was back in later. We also saw a few mistakes from Shaheen, most notably when he gave up a sack early in the 3rd quarter after missing a block (though Jordan Howard was supposed to help and also whiffed). Unlike his mistakes against Philadelphia, the coaches didn’t bench him in this game. What a novel idea. The Bears went for it on 4th and 3 in Cincinnati territory in the 2nd quarter! That was nice to see. Regardless of whether they converted or not, it was the right call, but it helps that they did convert on a nice catch by Shaheen. It was a quiet game for Dontrelle Inman, who didn’t even see a target, but Kendall Wright stepped up in a big way. He caught 10 of 11 targets for 107 yards (Chicago’s first 100 yard receiving game of the year) and proved to be a reliable target all over the field, especially on 3rd downs. It seemed like Wright was open on slant routes all day long, and Trubisky repeatedly took advantage of that. I’m looking forward to seeing Inman and Wright as Chicago’s 3rd and 4th wide receivers next year. What is it about Chicago cornerbacks and dropping interceptions? Kyle Fuller and Prince Amukamara both dropped gimme ones in the first half today, with Fuller dropping a second easy one in the fourth quarter. This continues a season-long trend for both players, who have generally been solid in coverage but struggled to make game-changing turnovers. The defense was incredibly banged up, missing 6 starters (Eddie Goldman, Mitch Unrein, Jerrell Freeman, Leonard Floyd, Willie Young, and Adrian Amos) and 2 more guys who would be starting due to those injuries (Quintin Demps and Pernell McPhee). It showed at times, as the Bengals were able to run the ball pretty well and there was very little pressure on Cincinnati QB Andy Dalton. But credit to a banged up unit for playing well overall, helped by an awful day by Andy Dalton. Christian Jones played mostly outside linebacker today due to injuries there, which meant we saw a lot of Nick Kwiatkoski inside next to Danny Trevathan. This was a good way to get a long look at two young defenders instead of only playing one of them. The personnel decisions at safety were not quite as good. Veteran retread Chris Prosinski started and played most of the game over 2nd year man Deon Bush. I don’t know if Bush is better than Prosinski or not, but I do know Prosinski is not good, and Bush at least has some developmental potential. Of course, Bush promptly got burned for a touchdown when he finally did come in. With Mitch Unrein and Eddie Goldman both out with injuries, we saw a lot of defensive linemen Jonathan Bullard and Roy Robertson-Harris today. This is great for development of the two second-year players, and RRH flashed with a sack (almost a safety) late in the 2nd quarter. Outside linebacker Lamarr Houston also had a sack, his second in two games since re-signing with the Bears. Cutting him at the start of the season was a mistake. If I’m the Bears, I think seriously about keeping Houston around as a 3rd or 4th OLB next season. Another young player who looked good today was rookie safety Eddie Jackson, who celebrated his birthday in style. He made a few nice plays in coverage, including snagging his 2nd interception of the season off of a tipped pass by Bryce Callahan (who also had a solid game today). Later in the game, Jackson stripped AJ Green to force and recover a fumble. 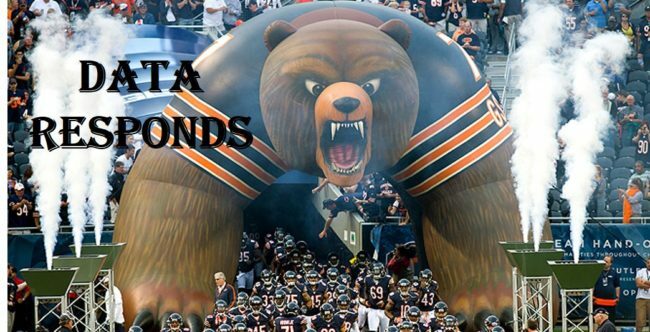 The Bears are now 2-0 in games in which Jackson forces two turnovers.